Beard Papa claims to make the world’s best cream puffs, and they aren’t lying. Fortunately for the folks at New Work City, they have a location just around the corner. Unfortunately, it’s been “closed for maintenance” since November. 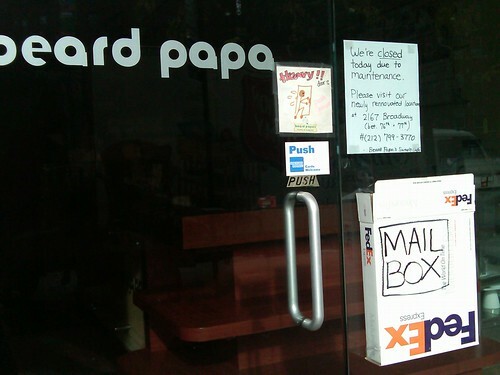 I walked by recently and noticed a FedEx box labeled MAIL BOX taped to the outside of the glass. It’s not just the unprofessionalism that’s amusing, but the fact that they’re asking the United States Postal Service to leave the mail in a competitor’s product. Do other people realize these things, or do I just have a very strange sense of humor? Would argue that FedEx is not a direct competitor of USPS, similar but different products.